For the vegetable oil, Cafe Du Monde recommends using cottonseed oil, presumably for that extra saturated fat goodness. i just had beignets at a restaurant, i am so excited to have a real recipe! oh my goodness, can’t wait to try it! thanks nola cuisine! Once again, a great picture. I can almost taste them. 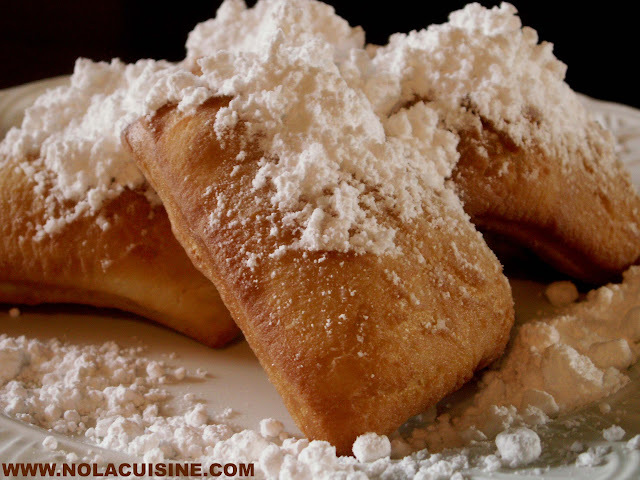 We grew up on beignets but without the powdered sugar. We used to eat them with butter and Pure Cane syrup. Yum-yum! Bitstreamer – God love CDM for their reckless abandon in the calorie department! I like to do what tastes best on this site, if it happens to be lard, lard it is. My pleasure Mona, I hope you enjoy them as much as I did. This site is all about recreating the lovely food of New Orleans at home. Laurie – I love the cane syrup as well, Steen’s is a wonderful product. I love it drizzled on Pain Perdu. Just curious — how can we match the convenience of just adding water to a pre-prepared powder? Thanks for sharing the beignet recipe! Blessings. yours is the fourth beignet recipe I have googled, and looks like being the most useful. But tell me, what is it about evaporated milk? Can one successfully use ordinary, fresh milk instead, or is there a magic additive that is a “secret ingredient”. Tony, homemade beignets made with fresh milk lack the special flavor that you get in those served in the French Market. The reason is the undiluted canned evaporated milk. When I grew up in the Irish Channel canned evaporated milk (pet milk) was a delicacy. Use Danno’s recipe as it is written and you won’t be disappointed. Thanks for the recipe it is perfect. Oh, it can be doubled without a problem. I made the beinget recipe, and it suprized me because even a 12 year old like me could make it! Resulting beignets weren’t bad for a first try. Had to mix up the yeast twice before getting it right and then the dough didn’t rise as much as I thought it would. Still, the recipe turns out an edible beignet in the hands of a beginner although different from both the Gumbopot at the Farmer’s Market and the beignets served at the Jazz Kitchen in Disneyland. I’m going to try this recipe myself. I tried to get the Cafe Du Monde mix (there’s a place here in Toronto that imports it), but they were all out. I’m going to try this recipe because I really want to make them tomorrow for some people who are treating me to a Canadian Thanksgiving. One thing, though…for this recipe, maybe the heat requirements are different. But I have found over the last few times I’ve tried making Beignets (with the Cafe Du Monde mix) that even just a little bit under the recommended 375 degrees F just doesn’t do that great a job. I have found that actually 380-385 is the ideal temperature for making beignets. But maybe this recipe calls for a slightly/somewhat lower temperature? Anyway, thanks for publishing. I will give it my best shot tonight and tomorrow. Technically, evaporated milk is like heavy cream, it can be whipped into cream. I’ve used buttermilk in it’s place for this recipe and like it just as well. Pingback: Yats - Fishers « I Eat Around - INDY! I agree…you can almost taste the beignets in the picture. While visitng New Orleans years ago, I wasn’t too enamored with creole cuisine but couldn’t stop raving about my discovery of these freshly-made, deep-fried, melt-in-your-mouth(so generorously dusted with confectioner’s sugar) French doughnuts. Would you believe that I purchased 2 bagfuls at the airport before getting on the plane? I just came back from NO, and I had the chance to try the beignet. I also watched as they prepared the dough, which they roll, cut and fry right away. In your recipe, you let them rise after the cut. Is this your preference? Does it make a difference? I don’t think I can wait that long to cook them. They are so good! I’ll be trying this recipe tonight! Can’t wait! When I read “shortening”, I think Crisco. Are there other options? Great recipe! And FYI, it works equally well without eggs, if someone has an allergy. They turn out fluffier – more like Krispy Kremes than beignets, but quite good. Sooo, does the dough absolutely have to be rising overnight? anyone care to help me please? OMG. I made some beignets today for Easter and I used this recipe, I added just a pinch more of granulated sugar. The recipe is sooo good my family loved them , my father who is from Louisiana said that they tasted like they were mad in New Orleans. This recipe is the best by far. great option for these is a raspberry puree and a bit of creme anglaise….sooooo yummy !!!!!!!!!!!!!!! Thanks so much for posting this delicious recipe. It’s been years since I’ve made my way down to the French Quarter but after seeing a few challenge shows on the food network featuring beignets, I was craving them. The ones I remember are the golden delicious puffy rectangles of goodness, not the doughnut hole fritters I’ve seen on TV lately. YOUR RECIPE ROCKS! Thanks to you, we have a whole family of true beignet fanatics!! One little tip: I love the look of the piles of powdered sugar pictured but when preparing for a family, you can go old school and toss them gently in a paper bag with the sugar. It gives an even coating like powdered doughnuts and is super quick. Thanks again! my beignets sometimes beautiful golden and sometimes turn “pale white”, WHY? I am such a fan of the beignet! When I was pregnant, I craved them after every workout. Fortunately, there was a great beignet place down the street from my gym. We all have our vices. Thank you for this authentic recipe. I would never waste my time or calories on the box mixes, so I am thankful for your posted recipe which is the real deal. Mictran, maybe they don’t brown because the temperature of the oil drops when you put the beignets in. Don’t put too many in at a time and try keeping a thermometer in the oil so you can adjust to keep the temperature constant. This is the best recipe of all time. My wife and I used a deep fryer with this exact recipe and the finished product was spectacular. We experimented and added chocolate to the middle of the beignet and they were delicious. Thank you. This is by far the best beignet recipe I have ever tried. Thank You.Thank You. If you replace the powdered sugar and use sugar glaze instead, it seems to morph into Krispy Kreme glazed donuts. Great recipe, but nothing beats an order of fresh beignets and a cafe au lait from Cafe du Monde on a Sunday morning. These are wonderful!! Very easy to make. very nice recipe! Made for a Sunday morning and brought me right back to New Orleans, if only in memory. Many thanks for your recipe posts! Thank you for this recipe! I made these for my kids this morning. It was their first day of school and they really wanted beignets for breakfast. These were delicious! Pingback: Beignets for Patrick « love. lust. butterflies.